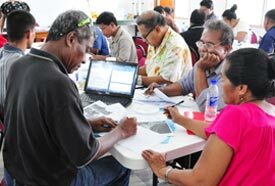 IOM, with funding from the United States Agency for International Development (USAID), and in coordination with the Pohnpei State Department of Education (PDOE), has organized a three-day "School Emergency Planning and Preparedness Training." The event, which was held at the PDOE Training Center and was linked to IOM’s Disaster Risk Reduction (DRR) Education pilot project, was attended by staff from 26 elementary schools and was designed to develop School Emergency Protection Plans – a requirement for school accreditation under the FSM National Department of Education (NDOE) standards. Participants included Mr. Pete Leon Panuelo, Chief of Elementary Division, PDOE, Mr. James Lukan and Ms. Oleen Poll of the Office of Environment and Emergency Management (OEEM), Mr. Wayne Mendiola of the FSM Department of Education, Ms. Rihna Jimmy of PDOE and Mr. Ashley Carl of IOM. IOM staff provided briefings on natural hazards, such as fires, tsunamis, typhoons, landslides, floods and medical emergencies. Principals and other school staff were also asked to prepare emergency management plans for their respective schools, based on an IOM-prepared template. Six schools – Awak, Kolonia, Nett, Ohmine, Sekere and Saladak Elementary School – also shared their experiences from fire response drills conducted with IOM and PDOE in March. IOM provided participants with education materials produced under the DRR Pilot Project, including 50 copies of each disaster preparedness comic book on landslides, typhoons and tsunamis. It also gave them climate adaptation and disaster preparedness coloring books, stickers, community and school banners, together with four different instructional poster designs. IOM will review the newly drafted School Emergency Plans to provide further technical input and then all the plans will be submitted to PDOE for their final approval. Following PDOE approval, all the plans will be returned to the 26 principals of the participating schools.